Of all the shapes for Valentine's Day chocolates, the heart is the one most associated with love. Making heart shaped chocolates from an ordinary bar of chocolate is sheer simplicity. If you are celebrating Valentine's Day with a cake then why not use the symbol heart itself as a cake to celebrate your Valentine's Day in a more special way. Are you going to use the same old idea and gift the same old flower bouquets to your Valentine? Then think again, the same idea might not just work this time! How about these amazing valentine edible bouquets that to made of flower of love ~ rose which will surely hit a chord with your Valentine. If you planned on a Valentine treat then you should probably try this recipe because the recipe will surely hit a chord with your Valentine since they have your heart and lovely conversations in them while made with fudge. Heart shaped Toasts makes a special treat for a loved one. Make these for Valentine's or another romantic occasion to impress your special someone to a romantic breakfast to express your love. Of all the shapes for Valentine's Day chocolates, the heart is the one most associated with love. Making heart shaped chocolates can be a bit of a challenge but hey it's valentine's day so you probably should do some hard work to impress your Valentine. Perfect for Valentine's Day, these cookies are delightful. They require a little extra effort, but the end result is definitely worth it. Celebrate your Valentine's Day with this special romantic treat which is delicious, loving and easy to treat your loved one's. If you love Valentine's day then you are surely going to love these cherry Valentine chocolate heart pops because this recipe will make your valentine fall in love with you twice in a row just like it's delicious juicy chocolate filled center. Treat your Valentine to a chocolaty devil treat which has a delicacy of a cherry and hotness of a bomb to set the Valentine's day mood on fire. Heart shaped fudge makes a special treat for a loved one. 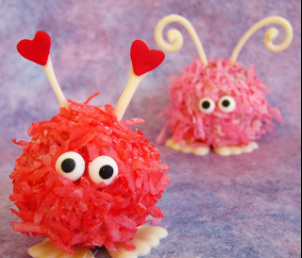 Make these for Valentine's or another romantic occasion to impress your special someone to express your love. Red velvet cupcakes are a miniaturized version of the famous red velvet cake. With the characteristic red batter that keeps its color upon baking, these red cakes are perfect for Valentine's Day, the Fourth of July or any occasion really! If you planned on a Valentine Cake then you should probably try this recipe because the recipe will surely hit a chord with your Valentine since they have your heart and lovely conversations in them. This Valentine Season express your lovely emotions to your Valentine with these cute adorable warm fuzzy cake balls and cupcakes which will surely hit a chord on Valentine's Day. Have more recipes? Recommend us and we will feature them here. You can use contacts to send us links to your recommendations or your own recipes.